What is Intelligent Power Tailgate Lifter? 1. Use the original keys to open/ close the Tailgate. 1.Control by the remote: Press on the remote control to open/close the tailgate, even if your hands are busy, you do this easily. 2.Button on driver's seat: where you are in driver's seat press the button to control tailgate easily. 3.Button on tailgate; the rear button on a tailgate, it close as you require. 4. Sound alarmed, warning timely. When close or open the tailgate, it will send out sound to alarm the driver and knowing the back situation to avoid damage or security risks. 5. Set the height, user-friendly, The tailgate can memory the height user pulls the gate to a level she could reach, then long press on the button so the height is settled, nest time, you open it, it stays the height you set 6. Smart avoid pinch user-safely. While the tailgate is closing, once it touches the obstacles (people or things), it will bounce back automatically or stop there, so avoiding hurt you. Why you need Intelligent Power Tailgate Lifer? If you too short to reach the tailgate, Power tailgate can set the height of the trunk, slowly push the tailgate to the adaptive position, press the button for 5s until you hear “Di-----” then the height has been set. When your car is dirty, you don’t want to make you hand dirty too, just press the rear button the tailgate will automatically close. 3. The package can be arranged according to customer's requirement. KaiMiao Group Limited Company, founded in 2015, is a professional enterprise specialized in Intelligent Power Tailgate Lifter and other auto parts products. 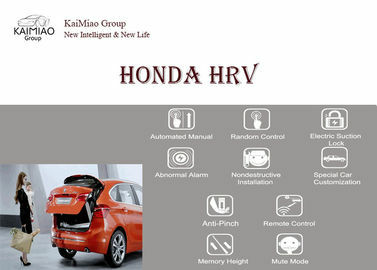 The company integrates R&D, manufacturing, and sales together and commits to providing convenient, safe and comfortable ideal life for global car owners. Adhering to the product the positioning of “differentiation, excellence, high quality”.